The Sacramento County Men’s Championship was held July 16-17 at Ancil Hoffman in Carmichael California. Eighty men played in this year’s event. The weather was nice, the golf course was good, and the greens were great. 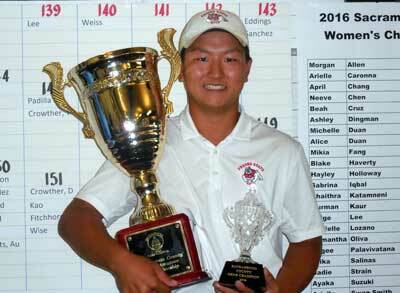 Alex Lee came from 3 shots back with a 5 under par 67 to edge out Saturday’s leader Jay Weiss by 1 shot. Alex finished at 72-67-147. Weiss was 2nd with 69-71-148. Connor Estrada shot 73-69-142 to tie for 3rd with Reece Williams at 70-72-142. Many thanks to all of the SGC volunteers, and a special thanks to Ancil Hoffman’s Tournament Director Kevin Cassidy, for making this tournament a success.